Beauty Blender 2 original pink blenders + liquid cleanser, 5 oz. Beauty Blender2 original pink blenders + liquid cleanser, 5 oz. beautyblender® times two! Double your fun with two of our award-winning beautyblender® originals and our popular 5 oz. liquid blendercleanser®all wrapped up in a perfect cleanser kit. Two beautyblender® originals to flawlessly apply foundation, powder, bb cream, cc cream, cream blush and more. One, 5 oz. liquid blendercleanser® to support the integrity of the blender as well as removes excess residue and germs for a clean makeup application. Use to clean makeup brushes, too! beautyblender® is handcrafted in the USA. beautyblender® is easy to use: simply wet. squeeze. bounce. your way to makeup perfection! squeeze. out the excess liquid, using a towel if available. bounce. concealer, primer, foundation, powder, cream blush or any other complexion product across the face for flawless results. 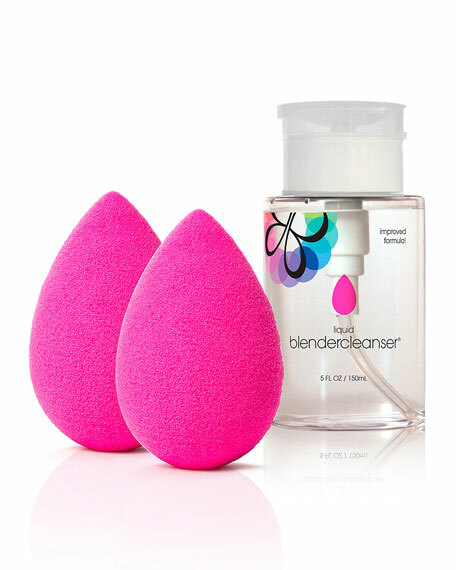 Apply a dime-sized amount of liquid blendercleanser® to solid areas of beautyblender®. Work into lather, rinse and repeat if necessary. Squeeze to remove excess water. Great for pre-soaking to remove stubborn stains. Makeup artist Rea Ann Silva launched beautyblender® in 2003, which revolutionized makeup application. Beautyblender®'s unique design helps achieve the perfect blend of makeup for a flawless face. Now, there are beautyblenders of all shapes, sizes, and colors for every part of the face. For in-store inquiries, use sku #1971950.